Note: This feature was written by Michelle Venetucci Harvey, CUESA’s volunteer coordinator. While your perception of Jewish deli food may conjure up images of sky-high piles of generic meat on rye bread, a new addition to the Tuesday market harkens back to an older—and more sustainable—idea of Jewish food. Wise Sons Jewish Delicatessen was launched with the hope of serving Jewish deli food made “from scratch and with love,” something the owners found lacking in the Bay Area. Bloom and Leo Beckerman (pictured center and right) met in college at Berkeley and founded Wise Sons after years of witnessing a decline in the quality and abundance of Jewish deli food (both can easily spout childhood stories filled with babkas and pastrami). Taking matters into their own hands, they started tinkering with pastrami recipes on a gas smoker in Bloom’s backyard, and with the urging of family and friends, they eventually quit their day jobs to open a deli. In January 2010, they got their start as a weekly pop-up in a restaurant space and they continued developing their menu, making contacts, and expanding to new locations. 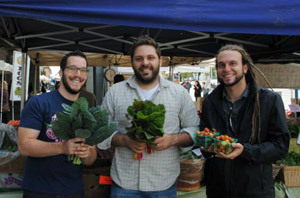 Last week they started serving at the Ferry Plaza Farmers Market, and they just signed a lease on their own space on 24th Street, with plans to open in 2012. A staggering amount of the menu is made in-house. “There was a time when every deli made its own product, and that changed as things became industrialized,” says Bloom. 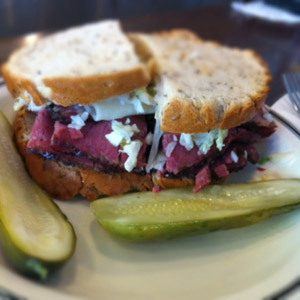 He and Beckerman decided to slim down their menu and focus on the key items they want from a Jewish deli, such as pastrami and pickles. Bloom and Beckerman are careful to point out that using a ton of red meat is not the most sustainable practice, and they take pride in their sourcing and the quality of the cuts they use. They source meat locally whenever they can, using chicken from Fulton Valley Farms, turkey from Diestel Turkey Ranch, some beef from Prather Ranch, and local fish. The bulk of their beef comes from Creekstone Farms in the Midwest, a source they feel is able to balance quality and quantity. “Some customers are quick to walk away when they hear that our meat isn’t local,” adds Beckerman, “but I would much rather have my meat coming from a little farther away than from animals living in poor conditions. That’s not something that we promote.” They have tested a variety of farms and cuts, both grass-fed and local, and feel that the end result is the best product they can offer. The produce on their menu changes seasonally as well. “There are people that won’t get it. They say they want their bagel with a tomato, but tough,” says Bloom. “I’m waiting until the season when they’re excellent, because it’s our responsibility to give you the best tasting product possible.” Moving forward, Bloom and Beckerman are excited to start purchasing more of their food from the farmers at Ferry Plaza and streamlining their service. What customers may not realize is that each pastrami sandwich is sliced to order, and both founders fervently agree that they will never get a machine slicer. They believe the skill and attention that goes into every sandwich is part of what makes them unique. So while customers will have to learn to do without tomatoes in the winter, Wise Sons promises a culinary and cultural experience. Wise Sons Jewish Delicatessen is now a permanent fixture at the Ferry Plaza Farmers Market, where customers can find them between 10 am and 2 pm every Tuesday.